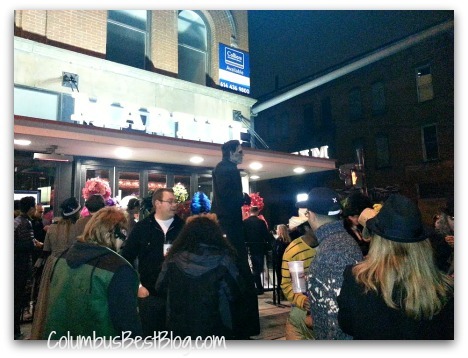 Are there always stilts involved in the “High” of Highball Halloween in Columbus? This Frankenstein monster was just one of many who dressed up complete with stilts for Highball Halloween 2012. I worried about the monsters, horses etc. on stilts slipping or tripping at Highball Halloween. I enjoyed seeing their costumes but heights scare me. The weather on Saturday night was reasonably good. There was a fine mist most of the time we were on High Street on Saturday night. It’s all relative…. weather Saturday night was way better than Sunday. Sunday was better than what we will have the next couple of days. It is supposed to rain on Wednesday night for Trick-or-Treat in most central Ohio communities. Even with high winds and lots of rain our Columbus weather forecast is way better than the weather forecast for West Virginia which is going to get snow. Or for the east coast which is going to get hit with Sandy. I just used the camera on my phone for most of the photos I took Saturday night at Highball Halloween and I was stuck down in the crowd on High Street. …way down in the crowd.